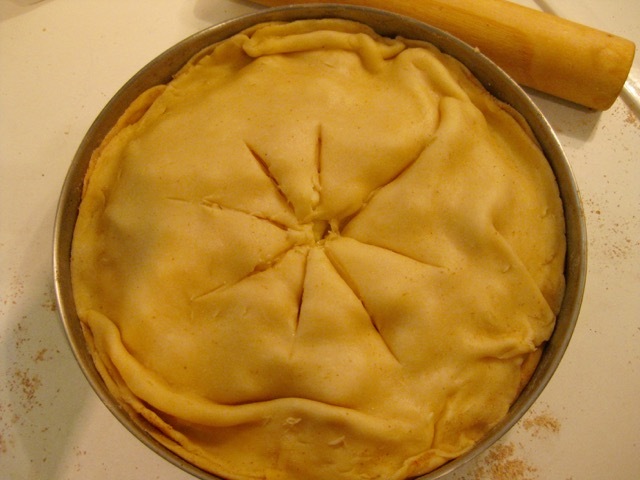 Last Monday, early in the morning, for our first quilting bee meeting after the summer, I thought of making an American Old Fashion apple pie. I found a recipe on Pinterest and adapted it. The crust I did is a classical French "pate brisee". For the filling I followed the recipe, with just a little less sugar. I forgot to take a picture of the apple pie just out of the stove. When I remembered it was more than half eaten! This week I went on with my double 4 patch blocks. I finished 10 more and have another 6 more to sew. Together I am preparing a tutorial for such a block. I ordered the batting from USA : Hobbs Heirloom 80/20, as I read from various sites that it is ok for wall hanging quilts. I hope to receive it in two weeks, and be able to give it to be quilted. 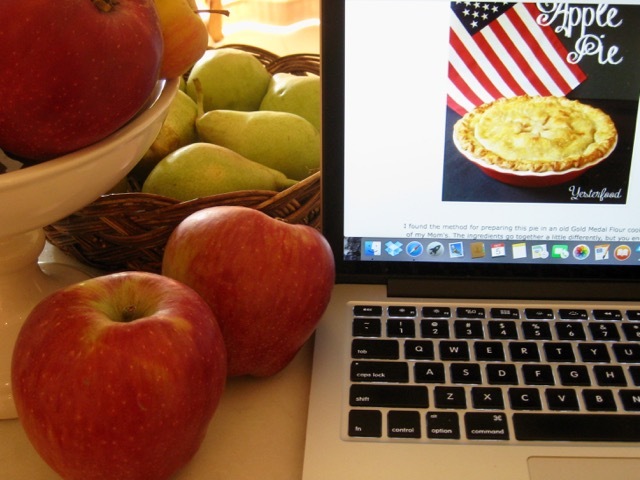 even your laptop is an apple! I am using an Apple iPad :-)) My favourite dessert is apple pie and I actually have one in the oven that will be ready in 15 minutes for dessert (it is nearly 8pm Sunday). Your double 4 patch blocks are wonderful. I really like the different fabrics you put together. Have a lovely Sunday. Ton Apple Pie avait l'air délicieuse ! 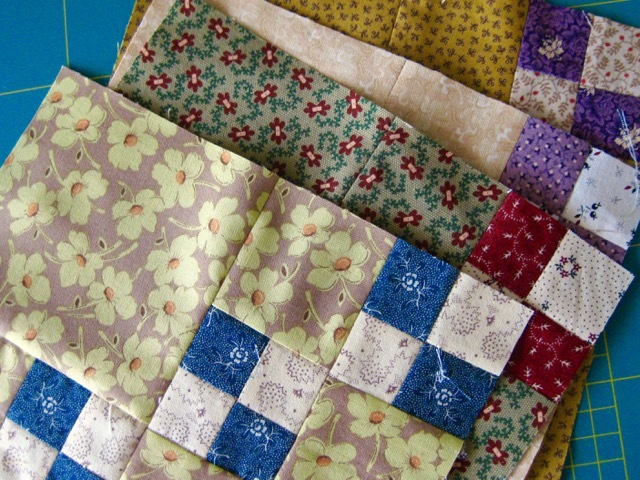 J'aime beaucoup les tissus utilisés pour ton quilt ! J'attends la suite avec impatience !! Pie looks great! That's a triple 4 patch, not double. The pie looks yummy! I am looking forward to your tutorial! Wow, that pie looks absolutely delicious! Yum! It's taking every single ounce of will power that I can muster to resist making one myself (I love apple pies ... and can't trust myself to have just one small piece/day). I love your Double 4 Patch. I'm curious - what do you have your little iron resting on? Your apple pie looks so good! I could almost smell it! Amazing what we can do with squares! Mmmmm...that pie looks so yummy! I have a sack of apples from a friend that I was going to use for applesauce, but I may need to make at least one pie after all! 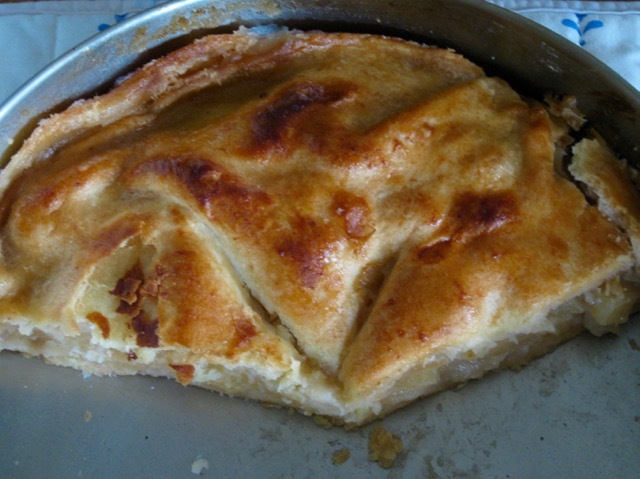 Love apple pie! Your double four patch is great, will watch for the tutorial. I really enjoyed your picture of your fresh apples and pears...oh yummm. Well, then the picture of the half eaten pie made me smile and hungry. Hee, hee, hee. Also, looking at the lovely fabrics for your 4 patches are lovely. I so enjoy the internet and seeing photos from everywhere. I am not much of a photographer myself, but sure do love spending time browsing through what others share. I just joined my first Project Linus quilters guild here in Grants Pass and met some wonderful quilters at my first meeting and so look forward to this months meeting. Thank You for sharing and have a wonderful creative day! A perfect combination... 4 patches and apple pie! Oooh, I've just made some apple crumble with apples from my friend's garden - it's the perfect pudding at this time of year! Now you've got me wishing it was dinner time! 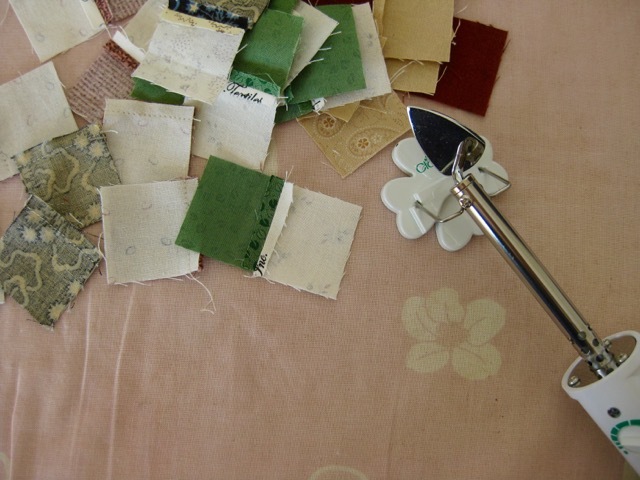 I love your double four patches Christine, the fabric combinations are going to look lovely. 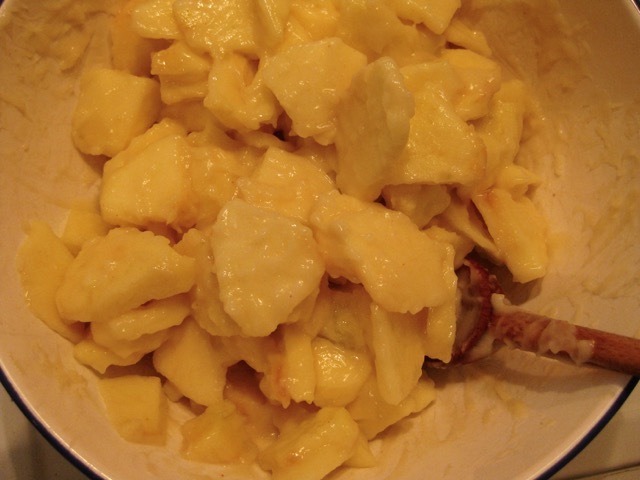 While you were making American Apple Pie I was making Marie-Helene's Apple Cake from "Around My French Table"! Yum, yum, yum. It's apple everything here this month! That looks so yummy! I think I need to make an apple pie this week. Your double four patches are looking good. That apple pie looks delicious! Must show DS2 as he is better at pastry making than I am. Our apple trees are flowering now, they look so pretty. Hope we get a good crop. 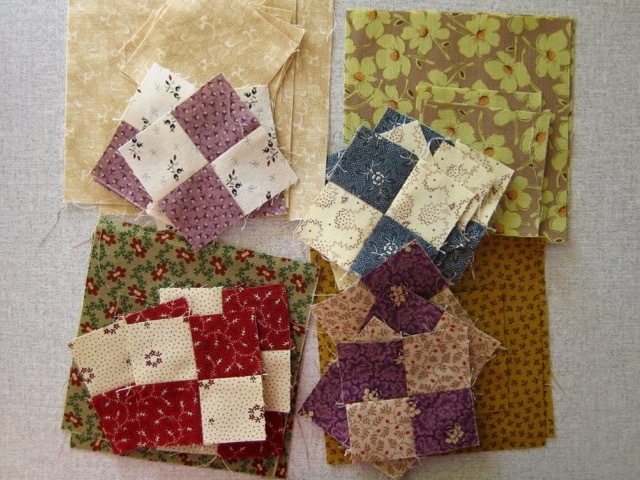 Lovely, scrappy four patches. Do you always press your seams open or just when you think it is best?